Highly selective molecularly imprinted mesoporous silica polymer (SBA-15@MIP) for baicalein (BAI) extraction was synthesized using a surface molecular imprinting technique on the SBA-15 supporter. Computational simulation was used to predict the optimal functional monomer for the rational design of SBA-15@MIP. Meanwhile, high adsorption capacity was obtained when a suitable yield of molecularly imprinted polymers (MIPs) layer was grafted onto the surface of SBA-15. 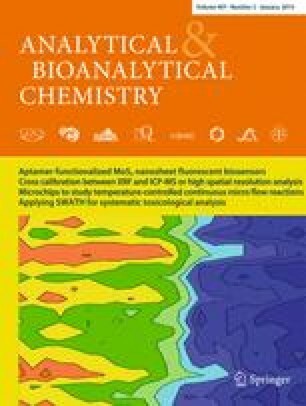 Characterization and performance tests of the obtained polymer revealed that SBA-15@MIP possessed a highly ordered mesoporous structure, reached saturated adsorption within 60 min, and exhibited higher sorption capacity to the target molecule BAI compared with non-imprinted mesoporous silica polymer (SBA-15@NIP) and SBA-15. Finally, SBA-15@MIP was successfully applied to solid-phase extraction (SPE) coupled with high-performance liquid chromatography and ultraviolet detection (HPLC-UV) for the determination of trace BAI in plasma samples. Mean recoveries of BAI through the molecularly imprinted solid-phase extraction (MISPE) sorbent, non-imprinted solid-phase extraction (NISPE) sorbent, and SBA-15 solid-phase extraction (SBA-15-SPE) sorbent were 94.4, 22.7, and 10.7 %, respectively, and the relative standard deviations were 2.9, 2.6, and 3.6 %, respectively. These results reveal that SBA-15@MIP as a SPE sorbent has good applicability to selectively separate and enrich trace BAI from complex samples. The online version of this article (doi: 10.1007/s00216-014-8285-7) contains supplementary material, which is available to authorized users. This work was financially supported by the National Natural Science Foundation of China (Nos. 30801558, 81173538, 21075066, 81373895).